If you’ve ever walked into a bookshop, library, or music store, then you’re already familiar with information overload. Access to all that data can be exciting, especially for knowledge-thirsty learners. But it can also be overwhelming, because you don’t quite know where to start. Content curation follows these same principles. You have these nuggets of data. However, unless it’s carefully arranged, it’s useless to your online learners. They need a quick, easy, intuitive system to help them wade through the data and make sense of it all. There are many ways to arrange supplementary online training materials. You could use alphabetical order, chronological listing, or group them according to the type of medium. Here are 5 top tips to help you analyze and organize curated eLearning content for your eLearning course. Reference materials will depend on two things. The first is online learners’ needs based on gaps or past eLearning experiences. For example, certain areas weren’t explored deeply enough in a previous eLearning course or module, or the eLearning professional may base their eLearning content curation efforts on their own personal eyepieces. For instance, they’re already familiar with the topic and know that online learners require more practical exploration of the subject matter. Alternatively, online learners may request certain eLearning content. Once you’ve gathered the necessary data, it needs to be sequenced. Arrange it from step one to the final stage, so that it’s easier for online learners to absorb. Numbered lists work well for easy recall. Since you have multiple sources of curated eLearning content, subdivide them either to follow the process flow, or use alphabetical order. This will also help online learners find what they’re seeking at a glance. Another option is to arrange references according to the area of discussion. Once your online learners identify which materials they need, you can categorize those needs. Find common threads and lump them together. Then, as you source curated eLearning content for each subject area, class them together. This way, online learners can reference the question they asked and go straight to that section. You might also arrange them by course topics rather than learner topics. Categorize the reference material based on the eLearning module or chapter it’s related to. This is helpful for learner revision. Create an appendix to accompany each chapter, so that they can easily identify the eLearning content they’re looking for. If you’re classing your curated eLearning content by module, ensure they are in different media formats. This way, online learners have a choice of how to consume their preferred eLearning content. Speaking of media, everyone has a different way of learning. Some people like to read the instructions, while others prefer to watch demonstrations. Other learners learn by doing. They want to jump right in and get their hands dirty. In terms of curated eLearning content, find multiple formats for each reference, so that online learners can select what works for them. You can class this curated eLearning content in broad groups. Group them under videos, audio clips, photos, illustrations, flowcharts, spreadsheets, and so on. Just be sure the breadth of each medium covers all relevant topics. If not, an online learner that uses only videos is unlikely to notice that he’s missing relevant data. If he never checks the articles' section, he would have no clue. For each medium, remember to include a time estimate. If online learners know how long it will take them to consume data, they can plan their study sessions better. If your curated eLearning content volumes are threatening to overwhelm you, you can always outsource. While it’s tricky to get someone to manage your curated eLearning content for you, there are other options. Plenty of content management online platforms automate the content curation process and make it easier for you to sort and organize your materials. Some of these platforms are free. Google Drive offers up to 15GB of cloud storage at no charge. It lets you sort your curate eLearning content into folders, which you can access using Google Docs. This allows for real-time collaboration and editing as you curate your eLearning content. Using Google to manage your curated eLearning content is helpful because you get access to all the components of the Google Suite. This includes email, photos, calendars, YouTube, Google Audio, and of course, the search engine. Once you’ve set up your curated eLearning content just the way you want it, there’s still more work to be done. Curated eLearning content is live, unlike course curricula and syllabi. Reference material, especially online content, isn’t static. It’s constantly updated and swiftly loses relevance. Every month or so, look through your eLearning content portfolio. Get rid of dead links, or material that is no longer valid. Replace it with more appropriate content. This is crucial in fast-moving industries like medicine and technology. There’s always something new to discover. While your eLearning course foundation may be consistent, refresh it with new online training material and current case studies. Keep an eye out. Whenever something important happens in your area of expertise, you can adjust your eLearning course material accordingly. Organizing your curated eLearning content is one of the most time-consuming aspects of the content curation process. However, it’s also one of the most crucial, as it makes eLearning content easier to digest. There are many different ways to analyze and arrange your curated eLearning content. You might arrange curated eLearning content in a logical sequence or a chronological order. You could class it by modules, chapters, or online learner FAQs. Or class it according to the type, whether they’re videos or caricatures. Whichever method you decide on, look through your online training material once a month to keep it all up to date. Do you know how to analyze and organize curated eLearning content? Is there a thorough way to curate eLearning content into learner-friendly formats? Do your curated online resources make the grade? Are they relevant, relatable, and reliable? 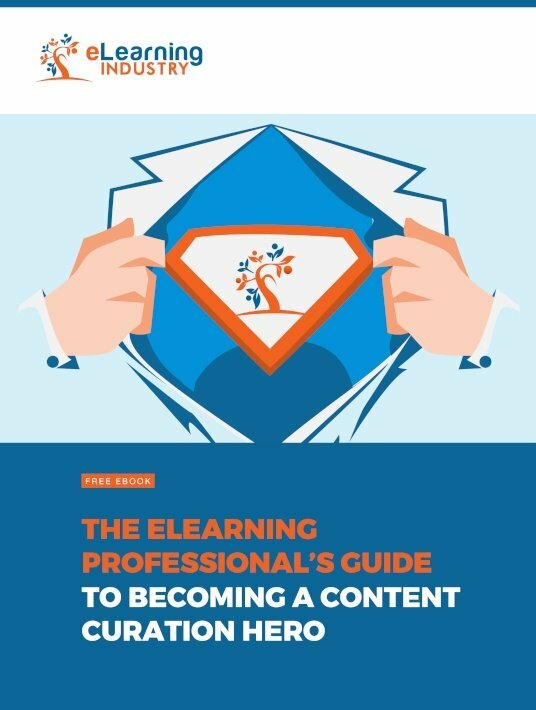 Download for free The eLearning Professional's Guide To Becoming A Content Curation Hero to learn about the most notable advantages of curating eLearning content. We’ll also explore top tips to automate the process so you can maximize your resources.